Australian band gets a sold-out house to stand, dance and sing along. 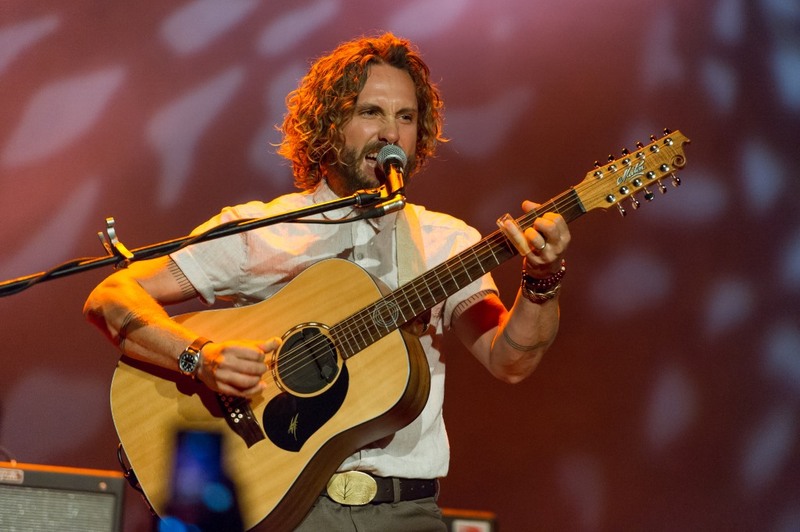 John Butler. Photo by Nick Semrad. 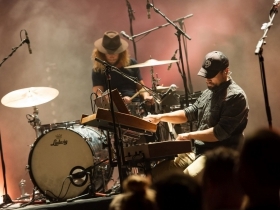 A full house, a blues and roots jam band and restrained stage lighting is what The John Butler Trio brought to the Pabst Theatre this past Saturday night. 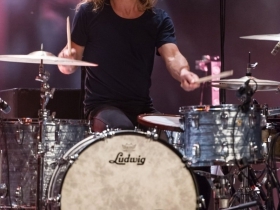 The trio was started by front man John Butler in 1998 and since then the band has changed members frequently. Currently it consists of Butler (guitar and vocals), Byron Luiters (bass) and Grant Gerathy (drums/percussions). The Australian-based band is currently on a world tour visiting cities throughout the U.S., Australia, Canada and Europe. 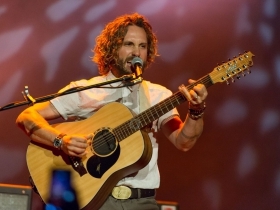 The John Butler Trio has won multiple APRA (Australasian Performing Right Association) and ARIA (Australian Recording Industry Association) awards including the 2014 ARIA award for Best Blues and Roots album for their album Flesh & Blood; this was their third album to receive this award. 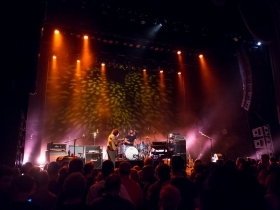 The sold-out show proved the trio has a strong following in the Milwaukee area. The audience spanned a wide age range and closely resembled the kind of hippies and music festival followers one would find at a Dave Matthews Band concert. 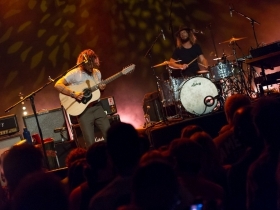 The John Butler Trio played all their best hits including a sample of songs from their 2014 album. By the second song of the set everyone was on their feet jiving to the group’s folksy blues sound. It did not matter if you were in the pit or the third floor balcony; everyone in the crowd was standing and swaying to the music. The trio played a myriad of songs, but there were three in particular that seemed to electrify the crowd. When Gerathy and Luiters left the stage and Butler plugged his ‘11 string’ guitar (only 11 strings are strung on his 12 string guitar) into the amp and began to play a few notes, a current surged through the audience and everyone knew what song he was going to play. Ocean is one of the band’s most popular and frequently played songs. While Butler progressed through complex chord changes and inventive techniques to extract unique sounds from his instrument, a silence fell over the crowd. The dim glow of people’s cell phones waving through the air dramatized how Ocean’s instrumental nature can captivate an audience. The trio also played their first hit and winner of the 2004 APRA Song of the Year Award, Zebra. Butler prefaced the song with a speech to hype up the crowd. He called for the audience to yell as loud as possible until he was satisfied with the response. Butler then asked “who wants to sing?” to which the crowd erupted with screams and clapping. For the duration of the entire song the crowd sang the chorus and imitated the variations of the melody Butler prompted them with. The audience clapped to the beat of the song and there was an energy that circulated from the stage to the audience and back again. The band seemed to feed off the energy of the crowd and vice versa. The John Butler Trio ended their set but the audience pleaded for an encore. The band came back to play Livin’ In The City from their 2014 album, and this acted as a catalyst for the audience to completely let loose. The entire theater sang and danced in unison. Every which way I turned there were people singing the lyrics and dancing as if the music had taken away all their cares. 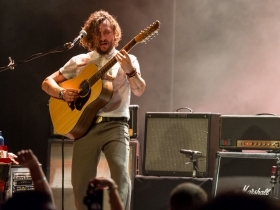 The John Butler Trio brought a contagious happiness to the Pabst Theater that left everyone feeling the power of music.